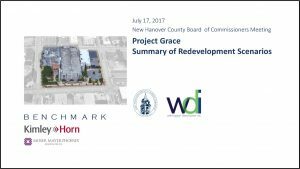 New Hanover County’s “Project Grace” is a potential redevelopment opportunity of a three-acre county-owned block in downtown Wilmington. The block is bordered by Grace, Third, Chestnut, and Second streets and currently includes the county’s Main Public Library, a parking deck, and several underutilized surface parking lots. 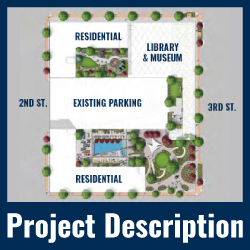 The project will potentially incorporate a public-private partnership, where the county would work with project teams to redevelop part of the site – adding taxpayer value through private investment – and also incorporate a modern Public Library, Cape Fear Museum, and parking deck. Community input will continue to be welcome throughout this project, and can be given at by completing the form on the Community Survey tab of this page. Sign up for periodic project updates here. Read a list of Frequently Asked Questions based on public input about the preliminary development proposal. 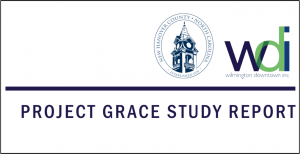 Project Grace is a strategic initiative focused on leveraging public infrastructure to encourage private development, ultimately serving our community as a project focused on Intelligent Growth and Economic Development. New Hanover County is in the unique position of owning an entire city-block in downtown Wilmington. This block currently includes a New Hanover County Library and a 640-space parking garage, but a large portion of the block is underutilized. 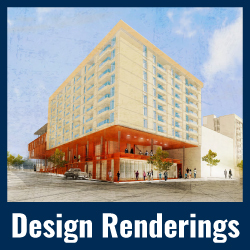 The vision for this block is to house a modern public library and Cape Fear Museum, better utilize the parking garage, and include private space for retail, residential, office, or hotel opportunities. In July 2017, a feasibility study was conducted outlining a path forward. The New Hanover County Board of Commissioners unanimously directed staff to proceed with issuing a Request for Proposals from project teams, which explores the options of entering into a public-private partnership. 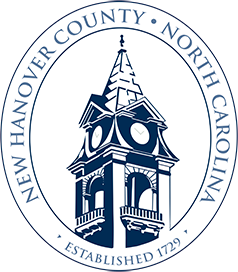 New Hanover County issued a Request for Proposals (RFP) in October 2018 and on December 14, 2018, the county received a full proposal from Zimmer Development Company and team. The county is currently reviewing the proposal and working with a financial consultant to provide a comprehensive analysis of the proposal. Opportunities for public input will take place on February 19 and 21 (see the “Public Input” tab of this site for more information). 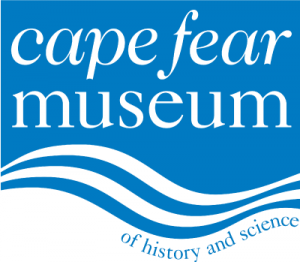 The county has conducted a separate study to determine the future use of the existing Cape Fear Museum site, and that study is not part of the Project Grace solicitation process. Capture the full market potential of the site to maximize revenue to the county, which will help to fund the construction or renovation of a new library and museum on the site. Include a modern library and a modern Cape Fear Museum either through new construction or by exploring opportunities for the renovation of existing space. Provide usable green space to enhance the aesthetic appearance of the site and outdoor functions of these services. Maintain library services in the downtown area during the construction or renovation process. Comply with the City of Wilmington’s maximum height limit for this block, which is 132 feet. The size, massing, and historical context of all proposed structures must be compatible with surrounding buildings. Provide a pedestrian friendly site design that is integrated into the downtown grid street network. And make accommodations for traffic and buses transporting groups to the museum and library. 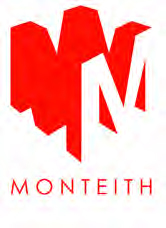 Ensure sufficient parking for library and museum patrons, as well as parking that accommodates the private development. October 2, 2017: watch staff’s presentation at the Board of Commissioners meeting (click on the images below to view the presentation slides). Watch New Hanover County Manager Chris Coudriet’s presentation at the December 2017 Power Breakfast, “Synergy: Transforming a downtown block by creating a cultural and educational nexus”. 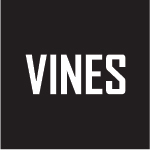 Click on the logos to below to view each company’s qualifications. 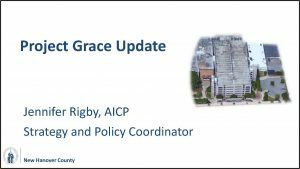 Community input has been an important part of Project Grace, and will continue to be welcome throughout the project. Residents are encouraged to provide their feedback about the project by completing the form on the Community Survey tab of this page. 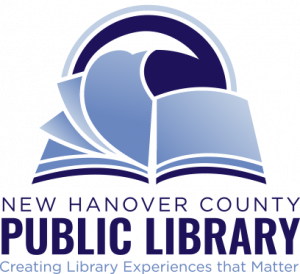 Thursday, February 21, 5:30-7:30 p.m., at the Downtown Library in the Hanover Room. A short presentation with an overview of the proposal was given at each meeting beginning at 6 p.m. The remainder of the time, attendees were able to ask questions one-on-one with county staff and the proposal team. In addition, attendees has an opportunity to provide written feedback about the proposal at both meetings. 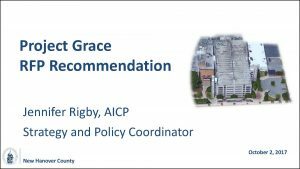 New Hanover County Commissioners and county staff have received emails and helpful feedback from the public since the Project Grace study was presented in July 2017. Two information meetings were held on September 18 and 19, 2017, to provide information about the study and possible scenarios for redevelopment. The public was able to provide written input at these meetings and ask one-on-one questions from staff. Residents are encouraged to provide their feedback about the preliminary development proposal by completing the form below. What excites you the most about the Project Grace proposal? What questions do you have about the proposal? What concerns do you have about the proposal?